Executive Chef Brandon joined the Bridges project because it was a new and exciting challenge that would bring something different for a small community in Central Indiana. Chef Brandon believes that cooking is a craft; you should cook from your heart and use the experiences that you have had in life. 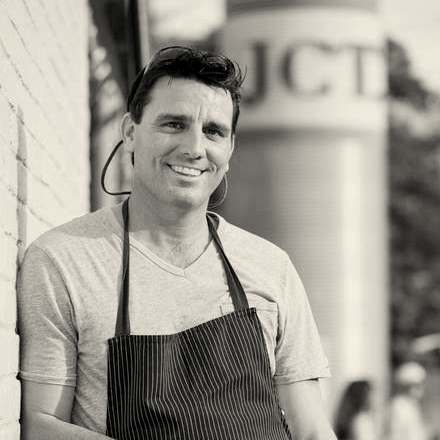 His cooking emphasizes local, seasonal ingredients, responsibly farmed meats, and sustainable seafood from local Florida waters. Chef Brandon was chosen to serve on the Founder’s Council for the inaugural Atlanta Food & Wine Festival, and he has also participated in the annual Cooking for Solutions event at the Monterey Bay Aquarium in Monterey, California. Chef Brandon is the Executive Chef of Luma on Park and Prato, both located in Winter Park, Florida, and Luke’s Kitchen & Bar in Maitland, Florida. After graduating from the California Culinary Academy, Chef Brandon passionately pursued his culinary career, seeking exposure to both domestic and international techniques and experiences, including the French Laundry in Napa and Chez Panisse in Berkeley. It was in these establishments that he first discovered his love for wood fired foods in the Italian tradition. When not in the kitchen, Chef Brandon is content with his role as a father of two boys and a husband. His other great passion is fishing for Tarpon!